Former Leicester City striker Emile Heskey has paid to tribute Vichai Srivaddhanaprabha, saying it is unusual for a club owner to be so "loved". Srivaddhanaprabha was among five people killed in a helicopter crash outside the King Power Stadium last Saturday night following the 1-1 draw with West Ham. Heskey, who was born in Leicester and made 154 appearances at the club at the start of his career, reflected on how much Srivaddhanaprabha meant to the football world. "In a day and age where it is easy to criticise owners, and it's simple everyone does it, where you have an owner that everyone loves, it's weird because of what he did, not just for the club but for the city," Heskey told Sky Sports News. "Donating to the hospital I was born in, the charity work he did around the city and then just little things he did for the fans. So that's why he was loved. "I was there (King Power Stadium) today and you see notes from Leeds, Huddersfield, Nottingham, London. 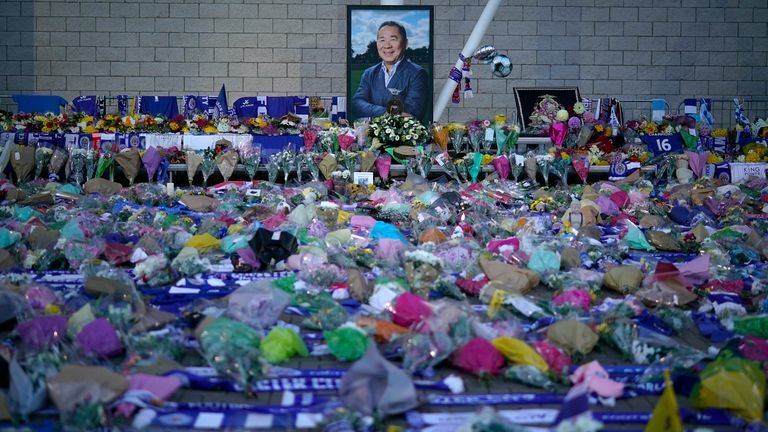 People coming from all over the country to pay their respects and you see how much he meant to football, not just for Leicester." Srivaddhanaprabha's funeral will begin in Bangkok on Saturday and could last for several days. Leicester's midweek Carabao Cup fixture against Southampton was due to take place this week, but was postponed until the end of the month as a mark of respect. Former England international Heskey was speaking at the Black List Awards, which highlights the contributions of people from African and Caribbean backgrounds to the game.